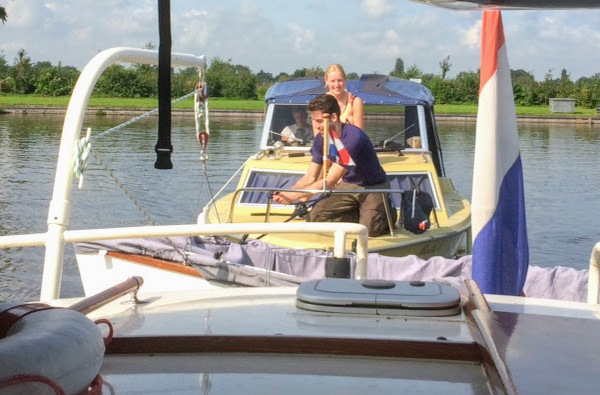 Four months after buying our Dutch motor cruiser, and just a month before we have to put her to bed for the season, we’re finally enjoying the lifestyle I hoped for when we talked about cruising the Dutch waterways. We’ve climbed most of our major hurdles now. We understand enough waterway rules and signs to keep ourselves out of trouble. We know where to find moorings, how much they’re likely to cost, and which moorings we can stay on for free. We understand all the costs involved, which has allowed us to budget for realistic expenditure next season. 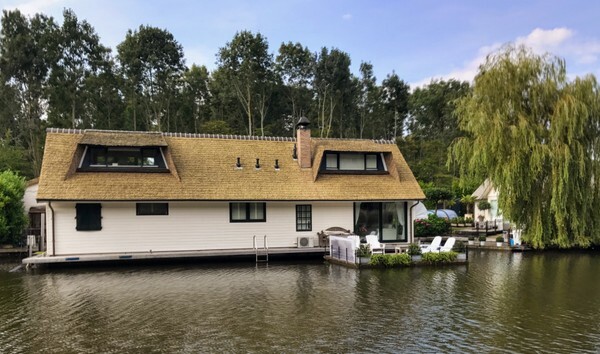 We realise the limitations imposed by our pretty little Dutch cruiser, and the likely cost of buying a boat more suitable for coastal waters and large inland lakes and rivers. Most of all, we understand how much we underestimated the Dutch network. As far as I’m concerned, the Waterkaarten app we use for navigation is an essential onboard tool. Finding your way around the English canal network is easy. You can travel for days on the same canal. 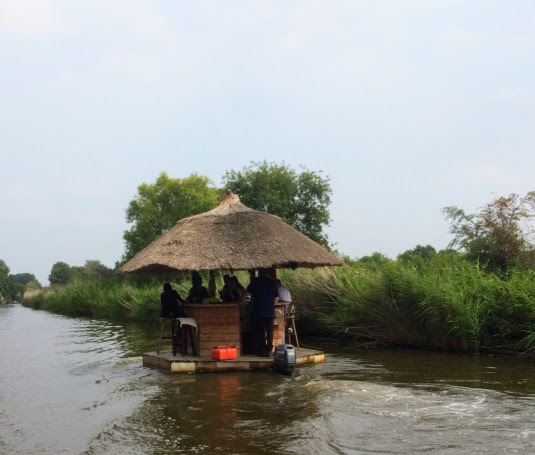 Making a turn onto another canal is a milestone, something to be noted and enjoyed. Getting lost is difficult. The Dutch network is very different. An uncountable number of dead end arms branch off hundreds of canals flowing through a bewildering number of connected lakes. Ask a boater in England how to get from London to Birmingham and he’ll tell you to either simply follow the Grand Union canal, or follow the Thames to the South Oxford canal and then turn left where the South Oxford joins the Grand Union. 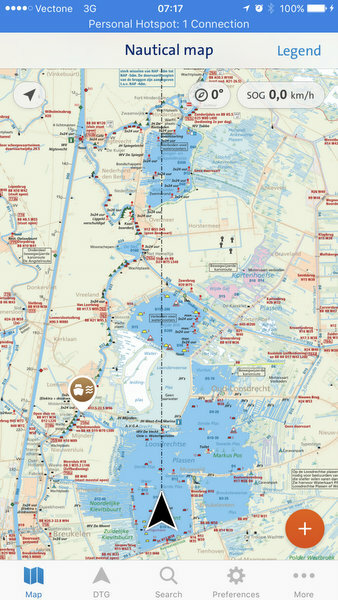 If you ask Dutch boater how to get from Amsterdam to Maastricht, a similar distance to London to Birmingham, you’ll need to settle down for a lengthy discussion about about possible route options, water depth and bridge height. We’ve clocked up 600km so far, but all of our cruising has been done no more than 50km from our home base at Leiden. We’ve passed through a dozen large lakes as we’ve cruised, each with its own collection of islands, many of which are free to stay on. Facilities range from simple box moorings on a bush covered spit of land to privately owned islands where, for a fee, you can enjoy manicured lawns, smart shower and toilet blocks, and moorings protected from the wind which often scours these vast expanses of open water. 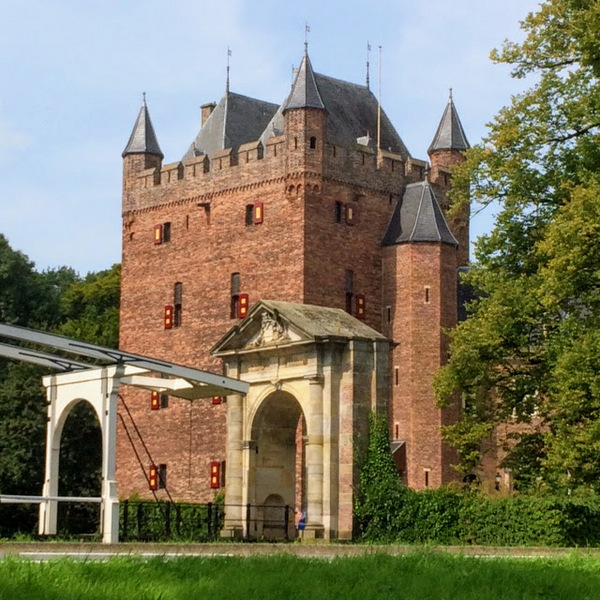 We’ve raced back to Leiden over the last three or four days, which has been frustrating because we’ve been delayed by a broken lock, a broken bridge, and my inability to absorb the mass of information available on my Waterkaarten app. I planned our route back carefully, paying particular attention to forecast wind strength to avoid another bumpy and rather worrying passage on the Ijmeer. We couldn’t resist staying a night at Jachthaven Stichting which nestles beneath Muiden castle. The marina is a wonderful but expensive place to stay for a day or two. We bobbed on the water under a cloudless sky, watching a steady stream of boats passing to and from Muiden’s tandem locks. While Cynthia did important womanly things on the boat, I did the manly work, trudging to the washing machines at a nearby marina, and then sitting with a coffee in the sun watching boats go by. It’s a hard life. Dutch locks, which frightened us so much a few weeks ago, are a breeze now that we know how they work, and now that we have developed a system for entering them without damaging Julisa or the boats around us. Julisa has five cylindrical fenders, three on the port side, and two to starboard. We need one more, and we need a pair of larger teardrop shaped fenders for the bow. These are essential for keeping the sloping bow away from lock walls or canalside moorings. Unfortunately, the missing white paint on the otherwise pristine bow is testament to our inexperience when entering the first few locks of our current cruise. I knew that we would need a pair of bow fenders before we passed through our first lock, but the only ones available at chandleries on our route have been for sale at prices that make me want to cry. The blue rubber 18” rubber spheres cost at least £70 each. We’ll be passing a low cost chandler next week, so we’ll buy a pair there, and some paint to repair the damage done by not having adequate protection. Our lock entry system didn’t work quite right in Muiden. Cynthia steered and I stood on deck ready to grab a passing lock bollard to pull us against the side. I cocked up, so the bow swung into an immaculate and ridiculously expensive Dutch day boat. These open boats often cost in excess of £100,000. Fortunately, they’re protected by thick rope fenders running continuously around the hull top so our awkward lock entry didn’t actually do any damage to anything other than to my pride. 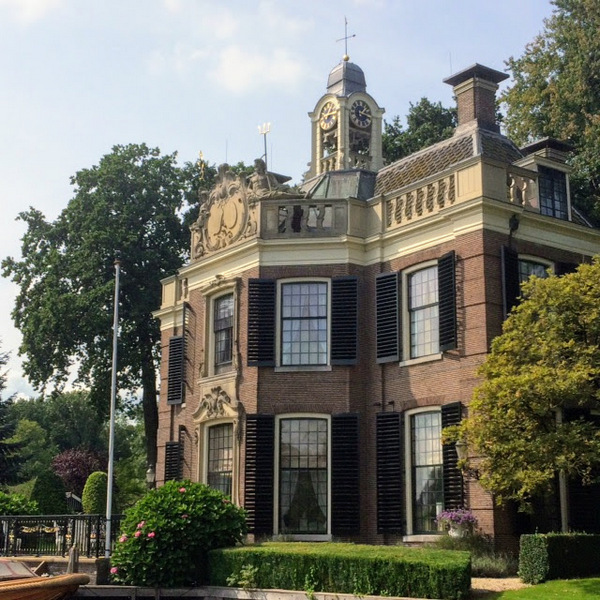 Once through the lock, we cruised serenely down the river Vecht. The river is very similar to affluent sections of the Thames with vast mansions surrounded by manicured lawns descending gently to the riverbanks lined with day boats costing as much as a small house. We stopped for the night at the Spiegelplas, a 700 acre nature reserve only accessible by dropping down a lock from the Vecht. “The Spiegelplas is the most beautiful lake in all of Holland!” the lock keeper assured us as he minced around the lock closely followed by his Filipino boyfriend. He may well have been right, but it was a pig to moor on. We cruised for an hour around the lake, visiting each of the nine designated mooring spots indicated on our Waterkaarten app. All were full, and as the lock wasn’t scheduled to open again until the following morning, they were all likely to stay full. We spotted our first Dutch waterways narrowboat on the Spiegelplas. The ten metre cruiser stern boat was anchored in shallow water next to a willow covered island. After an hour’s fruitless mooring search we weren’t in the mood for stopping and chatting so we left the owner sunbathing on his back deck before continuing on our lake circuit. We manage to secure the last remaining space at a lakeside yacht club where we enjoyed an alfresco meal at a waterside picnic bench before a good night’s sleep on a peaceful mooring. Rested and raring to go, we were at the lock landing by 10am waiting for the lock to open. We had a long wait. The low bridge adjacent to the lock was broken. “We had the same problem last week,” the owner of the boat moored in front told us. “That time, the bridge took twenty four hours to fix” We were lucky. After two hours basking in the sun, we were on our way again, cruising south on the Vecht for a couple of hours to another lock and another lake. The €5 lock fee came as a bit of a shock, especially as we only wanted to stay the night. 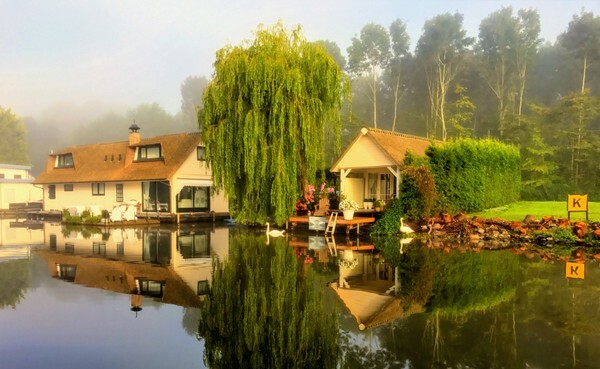 The Loosdrechtse Plassen is a beautiful expanse of water dotted with small islands, many of which have free moorings. Unfortunately, many of them are box moorings. Box moorings require boaters to climb on and off their boats from either bow or stern. Bow or stern entry isn’t easy for us, and is impossible for the dogs, so we need to moor alongside a pier. After an hour searching for a suitable place to stop for the night, we found Meent island. We had a jetty, and most of the five hundred metre long island to ourselves. Most of the island’s five acres were mown lawn dotted with shady trees. A small kiosk sold fast food and ice creams to cater for what I assume are throngs of boaters visiting the island to use the small sandy beach and sheltered swimming area. We were woken in the morning by the bin and poo boats. In addition to the fast food joint, the island has a small toilet block which stores waste in a septic tank. A large flat decked barge nosed into the bank behind us, then used a mechanical arm to swap full for empty wheelie bins. Another barge equipped with a powerful pump connected to a large holding tank moored close to the facilities block to prepare the island’s toilets for the weekend visitors. We began the next day on a good note. A small cruiser crewed by two inexperienced young Dutch couples was moored in a small bay on the opposite side of the island to us. Their engine wouldn’t start, so we towed them across the lake to a jetty close to their parked cars. After reluctantly parting with another €5 at the lock to escape the lake network, we continued south on the delightful and gentle river Vecht before a rude awakening when we joined the Amsterdam Rijnkanaal. Commercial canals are not a pleasant experience on our little boat. The canal is a through route for BIG barges, many of them a hundred metres long, weighing more than three thousand tonnes. We’ve passed fairly close to these monsters on open water over the last three months. Providing we don’t allow ourselves to be hit broadside by their bow waves, we don’t suffer too much. The experience is very different on a canal, especially when there’s a steady procession of these boats passing in both directions. The water displaced by boats of this size, often blunt bowed, cruising at ten to twelve knots, has nowhere to go. Waves radiate out from the barges, crash into the canal’s steep sided banks and bounce back towards the centre. Julisa didn’t like it at all. HOW MUCH WILL YOUR NARROWBOAT COST TO MAINTAIN? Purchase cost, licensing, part or full time mooring fees, propulsion and heating diesel, coal, gas and electricity generation costs... Trying to estimate the real cost of living afloat can be a real headache. In this comprehensive package, ALL the costs you are likely to incur are broken down and explained. Then you can enter your own specific costs in a bespoke narrowboat budget calculator. Low cost and backed by a 100% unconditional money back guarantee. We corkscrewed, pitched and rolled. Each violent movement was accompanied by terrified squeaks from Cynthia. We couldn’t move about the boat for fear of falling. Cynthia had to sit in the cockpit, braced against the boat’s pitching. I had to stand wide legged at the wheel to stop myself being thrown about the cockpit. Both of us were terrified. We watched as the Waterkaarten app tracked our progress agonizingly slowly towards our westward turn onto the Oude Rijn. Eventually we reached our goal, but the exit from the Amsterdam Rijnkanaal was almost as frightening as dealing with the wash from enormous barges. Shortly before we made the turn, an ear splitting horn blared behind us. Two towering barges, one overtaking the other, raced towards us from behind. Another equally large barge ploughed through the choppy water towards us. The slower of the two boats approaching from behind had to move over to allow the overtaking barge to squeeze between it and the approaching boat. The slower boat, still moving much faster than us, was the one sounding its horn. It was on a collision course with us, and we had nowhere to go. We reached the turning onto the Oude Rijn just in time. As we skidded around the turn onto the relatively calm water of the smaller canal, the two giant barges raced by. We’d narrowly missed being swamped by six thousand tonnes of racing steel, but we weren’t quite out of the woods yet. A narrow permanently open lock spanned the entrance to the Oude Rijn. A 2.5m high bridge arched over the far end. On calm water, a 4m wide lock and a low bridge wouldn’t be a problem, but with the violent wash from the two passing giants, we were being pushed up and down and swinging erratically from side to side. With just a 10cm gap between the bridges steel girders and our boat’s canvas and wood top, and 30cm high waves, I had to race through the lock and under the bridge between swells. We passed the bridge without scraping the canvas top off our cockpit, and then cruised slowly onto an entirely different waterway. After the turbulent water of the one hundred metre wide Amsterdam Rijnkanaal, the ten metre wide Oude Rijn felt claustrophobic. It appeared to be too small for even a modest boat like ours. The feeling was reinforced when our bow tipped towards the sky and then dived towards the canal as we slid over a high mud bank in the shallow water. Checking lock dimensions and opening hours is an important prelude to Dutch waterway cruising, as is also checking bridge height and status and, if the bridge is moveable, bridge opening hours. I had checked the bridges on the eastern section of the Oude Rijn the previous evening. I knew that some of them would be tight but, as the alternative was a much longer route via Gouda, I thought the additional stress of creeping under stone or steel bridges a cigarette paper’s width above our delicate canvas top would be worthwhile. Of course I made that decision from the security of our tranquil mooring on an expansive lake. I didn’t feel quite the same way creeping under an arched stone bridge that was barely high enough to allow us to pass at its centre. The bridge’s arch dropped perilously close to the varnished cockpit surround as we squeezed underneath. After another handful of equally low bridges, we reached one which we knew we couldn’t pass under. It was just one metre high. Fortunately, it was a lift bridge. Unfortunately it closed at 4.30pm. We reached it at 4.36pm. With no way of turning on the narrow canal close to the bridge, we moored on a nearby wooden pier. Our nighttime sleeping spot was far from ideal. We were in a busy town centre. A continuous stream of heavy traffic crossed the bridge in front of us and along the two roads which ran either side of the canal. The traffic was noisy, but not as noisy as the people. The short pier we were moored on was very popular with the locals. A mother brought her two small children to fish in the canal. When one five year old couldn’t cast into the canal because of our boat, he started to climb onto our back deck to reach the water. His mother eventually dissuaded him. A teenaged couple chatted animatedly less than a metre from where we sat in our cockpit. Their noise was bearable, but the din created by two drunk and very vocal cocktail drinking teenage girls who sat on the pier next to our stern was not. We realised that we were in for a noisy night before we could escape when the bridge opened at 9am the following day, and then we realised that there was no point in waiting for the bridge at all. I checked the route ahead more thoroughly. Our boat’s air draught is listed as 2.5 metres. However, we have squeezed under some bridges slightly lower. I traced my finger along the map. A series of 2.5 metre bridges, then one at 2.45. That would be tight. The next was 2.4, which was worrying. Two point four metres didn’t seem too bad at all when I spotted a bridge further along the route. At 2.15 metres, there was no chance of passing it. Google Map’s satellite view saved the day. I used the measuring tool to check the canal width. At our cocktail party mooring, the canal was just eight metres wide. Julisa is about eleven metres long including the dinghy. Three hundred metres behind us the waterway widened to fourteen metres. We could turn there providing that we didn’t ground on the edges of the already dangerously shallow waterway. The two cocktail drinkers were so drunk that they didn’t understand that I was trying to untie Julisa’s stern line from the wooden pole they were slumped against. After failing to get a response several times when I asked them to move, I had to lift one of them out of the way. She didn’t seem to notice. As darkness fell, we reversed apprehensively along the boat lined canal to the wide section. Thank God for the bow thruster. It made the normally frustratingly difficult job of reversing a boat in a straight line a breeze, and then allowed us to quickly spin the boat in her own length. Being able to turn around was a mixed blessing. We were able to escape from the too low bridges of the Oude Rijn, but now we were faced with a further 6km joyride along the Amsterdam Rijnkanaal. Our second brush with the big barges was far less frightening. The canal was quieter and the water far less agitated at 7am the following day. We didn’t once fear for our lives, but we did feel slightly sea sick. We needed to pass through a lock to escape the big canal. We arrived on the lock landing at 8am. The lock didn’t open until 9am. We had an hour to enjoy a leisurely breakfast, providing the boat stayed still long enough to let go of our dining table. I took this short video as Cynthia prepared our morning meal. Even though we were a hundred metres away from the Amsterdam Rijnkanaal, we were still constantly buffeted by their wash as we tried to eat. As I complained while prodding a fork full of food for the third time into my ear instead of my mouth, Cynthia quoted one of her favourite sayings, “Remember, this isn’t a third world problem!” She was right. We weren’t starving, although if we stayed on the lock landing for a few days, I think we would have been very hungry. By mid afternoon, after six hours of pleasant cruising on the mainly rural Hollandse Ijssel, our plans were thwarted at Haastrecht by the usually faultless Dutch bridge automation. Most bridge opening is automatic. A single red light indicates that the bridge is operational but you should wait. However, some are frustratingly awkward self service. Somewhere close to the bridge, only accessible from the water, there will be a small button which has to be pressed to close the bridge’s road barriers and either lift or swing the bridge. On a cruiser even as small as ours, pressing the button means nosing the boat almost within touching distance of the bridge, and then laying on the deck and reaching down to press the button. We only learned about this self service bridge type after waiting patiently for half an hour at one bridge for it to open. Eventually, a Dutch day boat sped past us. The owner skidded expertly to a stop inches from the bridge, leaned casually over his bow, pressed the button and then reversed just as casually backwards to wait a minute or two for the bridge to open. After that, we checked each bridge carefully for hidden buttons. The bridge at Haastrecht had one. Our bridge management skill was a joy to watch. Cynthia expertly maneuvered the bow close to the bridge. I hung off the bow like a monkey to press the button. We congratulated ourselves on a job well done, and then reversed a little to wait for the bridge to open. We should have noticed the bridge’s two red lights, which meant that the bridge was out of service. And then we noticed a line of moored boats filled with boaters enjoying the spectacle. One told us that the bridge was broken. An engineer was on his way, but the bridge probably wouldn’t be operational until the following day. We found a space among the waiting boats, and then watched the engineer work on the bridge until 10pm. A cheer heralded the bridge raising once again. Two boats slipped through before the engineer left for the night. We laughed. What was the point? The next bridge, closed for the night, was just half a mile away. We weren’t laughing later on that night. The bridge developed a mind of its own. The road barriers dropped on their own, the bridge raised briefly and then dropped again. Much to the frustration of local bikers and car owners, the road barriers stayed down until the following day. A further three hours work the following morning by the same engineer finally cured the fault. The bridge raised, horns tooted, and a dozen boats raced through the open bridge before anything else went wrong. We cruised 38km yesterday, through Gouda, north to Alphen aan den Rijn, and back onto familiar ground. We spent the night at a marina near Aalsmeer where we knew we could empty our toilet cassette for the first time in a week. We can now make our 21l holding tank last a long time with a little care and late night hedge watering. 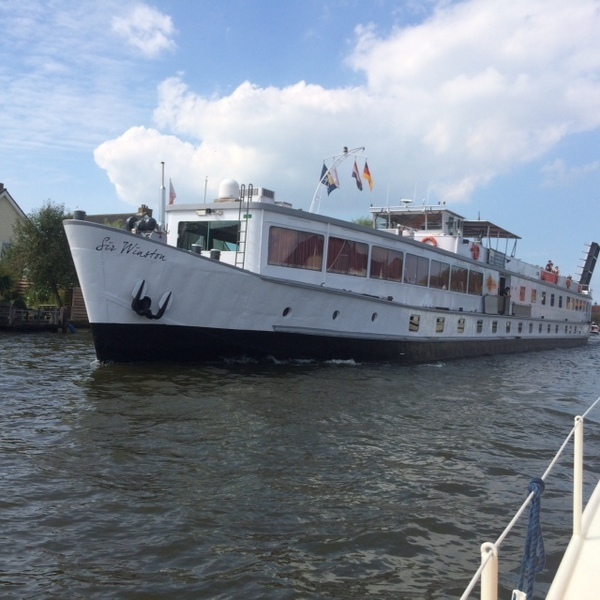 After a two hour cruise this morning, we’re back at our Leiden base. We have jobs to do which require the Hymer. 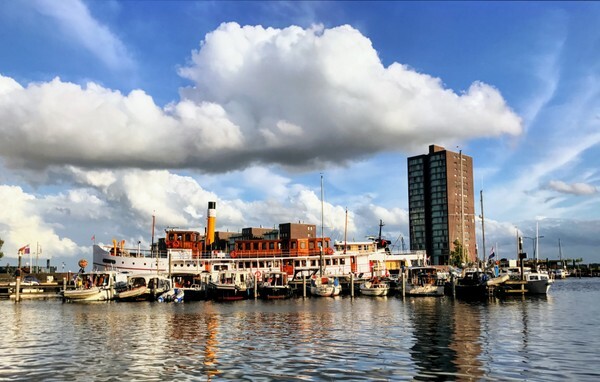 Cynthia has another appointment at her Eindhoven clinic, we need to get passports for both Tasha and Abbie in preparation for our forthcoming brief return to the UK, and we need to search for a low cost chandler with affordable fenders for our bow. Cynthia’s out shopping on her little folding bike at the moment. When she returns, we’re going for lunch at a canalside restaurant in the heart of Leiden. We’ll watch the boats pass slowly by and wonder, once again, which way to go. Do we keep our summer boat and winter motorhome, or do we sell both to buy a more comfortable and capable boat for full time living and cruising on the European network? As Cynthia would say, it’s not a third world problem, but it’s the only problem we have, so we’ll continue to focus on it. When we first made an appearance at Jos van Galen’s boat yard, we had to guide Julisa down a very narrow canal just barely missing the houseboats lined up along the way. Just trying not to run into anything was a major accomplishment! Then in order to moor up properly we had to go past the boat yard and turn around in a small space then backtrack. I remember those first few times how much in awe I was watching Paul manoeuvre the boat around. The first time or so was a little tense, then it became routine. As we approached the canal I was gagging my nervous level and surprisingly found myself to be quite calm, even though in part of my mind I knew I could easily screw it up. In all truth it turned out to be far easier than I had imagined, and with just a few timely words from Paul, before I knew it I had turned her around and was headed to the mooring spot! I was SO happy to end this journey on a positive note. I haven’t done a lot of the helmsmanship while cruising, not because I don’t care to do so, but because I usually find myself involved in cooking, cleaning, watching our progress on the chart or other (seemingly) important tasks. What I DO do the majority of the time is bring the boat in for mooring, whether it be along side a canal or lake or in a lock. At first I was nervous about doing this, but thanks to Paul’s excellent directions it has become quite easy. I’ve developed a system when docking on the starboard side that works well for me. I have the window in the main saloon to look through in order to gauge my distances. Without this, it is difficult to see very well to the right since the wheel is on the left (port) side. During these past three weeks on the waterways I’ve had the opportunity to watch many boats mooring up and have come to the conclusion that nearly 100% of the time, the man steers the boat while the woman handles the lines (or ropes as they are called depending on the country you are from). 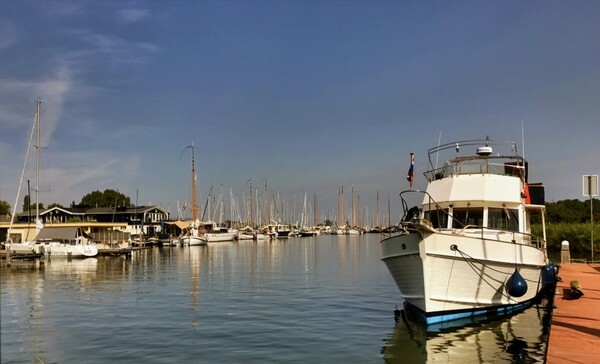 The reason I don’t handle the lines–which usually involves jumping or taking long steps from boat to dock–is because of the injury to my right groin that I sustained a couple of years ago. It unfortunately has limited some of my movements, though I am working at improving this. These past three weeks really put my skills to the test, as every lock or docking situation is different depending on weather conditions, the wind, how many boats are in the lock with us, etc. I really find that I am up to the challenge (a good part of this is because I have such an excellent mentor! ), and I will continue to welcome the challenges as they present themselves. It’s been a great three weeks and we have been blessed with wonderful weather, kind people and lots of exciting experiences and personal interchanges with our fellow boaters. I just wish the summer wouldn’t end! I enjoy writing newsletters which, I am often told, are very useful to anyone considering living an alternative lifestyle either afloat on the English or Dutch waterways, or leading a nomadic life on the road in the tiny living space offered by a motorhome. The downside is that adding content to the site, maintaining it, and answering dozens of emails each week takes a considerable amount of time. I invest up to twenty hours every week on the site and, over the course of the year, many hundreds of pounds. I can’t afford the investment in either time or money without a little help. If you are in the fortunate position to be able to afford a small financial subscription or one off donation to help with the site’s running costs, please click on this link to find out more. If you are one of the generous souls who already support the site, thank you!